History: US 15 is an original US Highway. Here is a geographic look at its history. US 15 appeared in North Carolina in 1927. It was assigned to the entirety of original NC 75. It began at US 1-74 Rockingham (jct of Washington Av and Hancock) and headed west with US 74 along Hancock over to Broad west to Old Ellerbe Hwy. Here US 15 split with US 74 and headed north. It picked up today's US 220. US 15 followed US 220 (except used Billy Covington Rd) to Ellerbe, and followed today's US 220-A up to NC 73 east. US 15 followed NC 73 to West End, then NC 211 east to NC 5 east to past NC 2 in Pinehurst, then cut northeast through what is now part of the golf course in line with Palmetto St NC 2. It was placed on the general corridor of today's US 15 from the South Carolina line through Lauringburg and Aberdeen and Pinehurst. This replaced US 401/NC 24 from SC to Laurinburg; US 311/NC 241 Lauringburg to Aberdeen; US 311/NC 70 Aberdeen to Pinehurst. NC 2 from Pinehurst to West End; NC 73 West end to Ellerbe; US 220 Ellerbe to Rockingham. 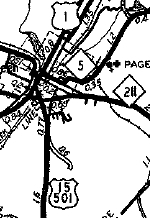 Between 1940-44, US 15 was removed from the straight Palmetto St and placed on the current zig-zag NC 2 as it runs now in Pinehurst (thanks to L Corsaro for noticing this). Between 1945-49, US 15 was rerouted entering Aberdeen to its current US 1 approach. Before, it used Glasgow St to South St west across US 1. 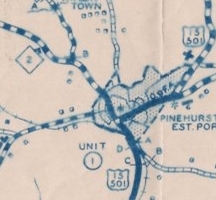 In 1956 or 1957, US 15 was rerouted in Aberdeen to avoid central Pinehurst, as it runs now. This was additional duplex with US 1 and new construction. 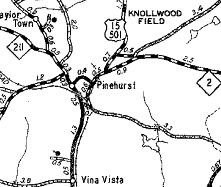 The old route to Pinehurst became part of NC 211 (now NC 5). Leaving Pinehurst the route became NC 2 and Page Rd. In 1956 or 1957, US 15 was placed on its current western bypass of Laurinburg. Most of the old route through town became mainline US 501 except at the southern end of the old route was part of US 401-A (now it is all US 15 Business). US 15 originally used Lea Rd, Blues Siding Rd and Shady Lane Rd sprinkled with current US 15-501 motoring from Pinehurst toward Carthage. US 15 used NC 22 into Carthage, then NC 24-27 out the east side. US 15 picked up Union Church Rd and Stage Rd before using today's 15-501 over to US 1. US 15 followed US 1-15-501 to just past NC 78 then used Carthage Rd into Sanford. US 15 picked up US 1 Business through town, then US 15-501 north of the bypass. Across the Deep River, US 15 picked up Walter Bright Rd and a substantial Old Sanford Rd most of the way to Pittsboro. It appears US 15 used today's 15 through Pittsboro. US 15 used Bynum Rd to cross the Haw River, then used US 15-501 into Orange County. 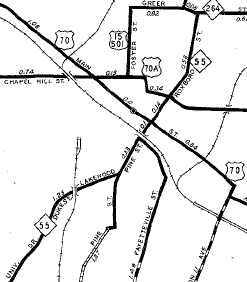 US 15 initially followed NC 86 into Chapel Hill, then used Franklin St east to leave town. After a brief jaunt on US 15-501, US 15 used Old Chapel Hill Rd to Durham. Between 1931-36, US 15 was removed from Lea Rd and also from Union Church/Stage Rd east of Carthage. Between 1950-53, US 15 bypassed Bynum. 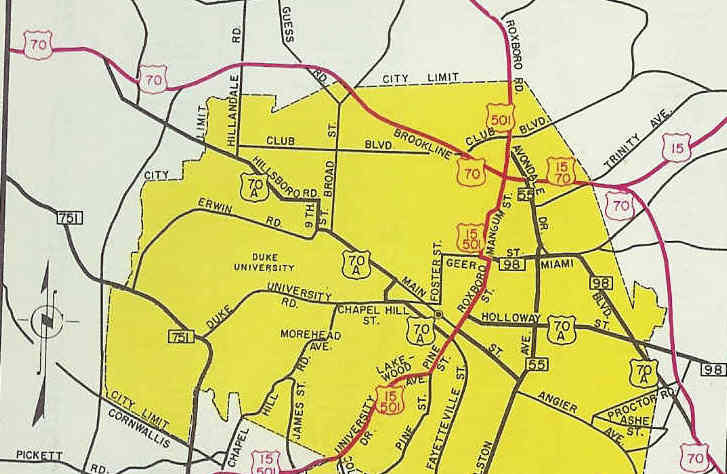 About 1951, US 15 was placed on its current routing between the Chapel Hill and Durham bypasses. 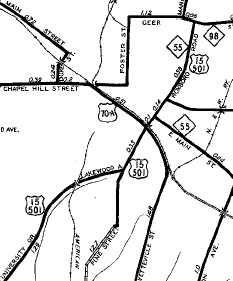 In 1953, US 15 was placed on a new bypass east of Chapel Hill, leaving behind US 15A-501A. Between 1954-57, US 15 was removed from BluesSiding Rd and Shady Lane Rd. 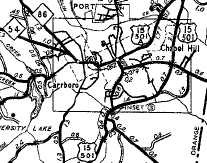 In 1956 or 1957, US 15 was rerouted to the east of Carthage like it is today, leaving behind pieces of NC 22 and NC 27. 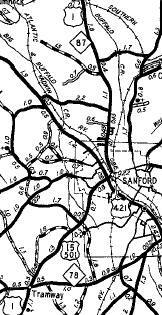 Also in 1956 or 1957, US 15 was put on the new bypass west of Sanford, leaving behind US 1A-15A-501A. US 15 wasn't removed from Old Sanford Rd and Walter Bright Rd until after 1968. Originally, US 15 cut east on Morehead Ave, then Kent St, then east on Chapel Hill St. US 15 turned north on Magnum St, then cut over to US 501 Bus on Markham Ave. US 15 followed US 501 Business north to Geer St, east out of town. 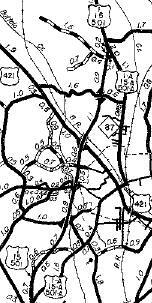 About 1934, US 15 was rerouted to leave Chapel Hill Rd at Foster St which it used north to Geer. About 1951, US 15 was moved onto the current US 15 Bus-501 Bus routing, with US 15 still using Geer St leaving Roxboro Rd. 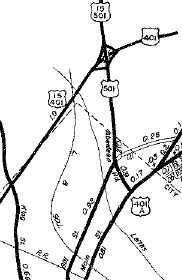 In 1956 or 1957, US 15 was rerouted to follow US 501 out to the newly extended US 70 Bypass (current I-85), but cutting west on Geer to Magnum, then north out to US 70. US 15 followed today's I-85/US 15 northeast out of town. 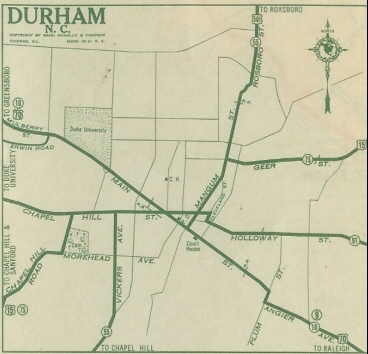 In 1960, US 15 was moved to its current bypass west of Durham, which is shown as complete on the 1957 County Atlas with no number (1959 Official Durham inset also shows unnumbered bypass). This left behind US 15-501 Bus. US 15 rerouted to Foster and Geer Sts. US 15 rerouted off Geer US 15 placed on Durham Bypass. US 15 initially used Geer St/SR 1670 out past Redwood Rd. Then the route used the current I-85/US 15 right of way to cross the Neuse River. on the other side, US 15 used its current route to Creedmoor and Oxford. THe route also followed today's US 15 until just before the Virginia line, where it veered northeast onto SR 1500 "Old US Hwy 15" to reach the state line. About 1953, US 15 was moved off of SR 1500 at the State Line and placed onto its current routing. 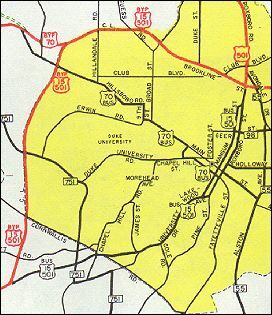 In 1956 or 1957, US 15 was removed off Geer St/SR 1500 and put on the current I-85 routing. NC 75 north of Durham US 15 placed on NC 75. 1935 General Draft shows sorta the correct thing. 1935 Gousha shows US 15 running Laurinburg, Fayetteville, Raleigh, Cary, then northwest to Durham. 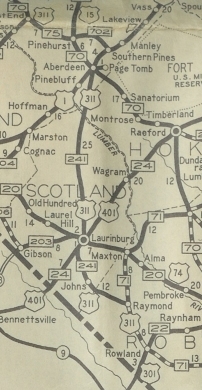 US 15 from Laurinburg to Durham is shown as solo US 501. US 15 is a fairly minor road for a US Route. Especially below Sanford where it loops back and forth to US 1. Other than Chapel Hill to Durham it is still essentially 2-lane almost everywhere, just like it is almost everywhere in Virginia and South Carolina where it runs as a solo route. The US 501 duplex is quite long and not really necessary. US 15 could have been routed to Fayetteville, Raleigh and Creedmoor like US 15-A was for 20 years.